Knosys Limited is pleased to announce a profitable result for the second half of the 2018 financial year and a 225% increase in revenue for the full financial year. This announcement continues the growth and success of this Melbourne-based knowledge management software company. 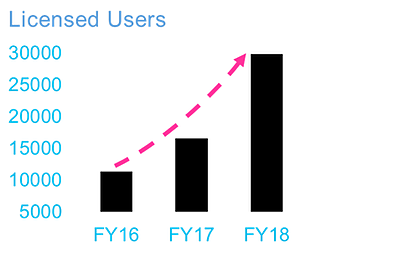 The licensed user base of the Knosys product increasing by 80+% to over 29,900 by the end of 2018, with the commencement of invoicing of monthly licence fees for the new Optus contract. With the continued expansion of the market and the adoption of knowledge management and business process technology across many industries, Knosys is well placed to expand its customer base and add to its offerings through internal developments and acquisition of technologies. Whilst sales and marketing efforts are focused on direct initiatives, Knosys is also planning further developments that will allow greater partnership opportunities with global software vendors to address local and international opportunities going forward.